The ship arrived at anchor in the lagoon around Taha'a at around 7:45 AM. 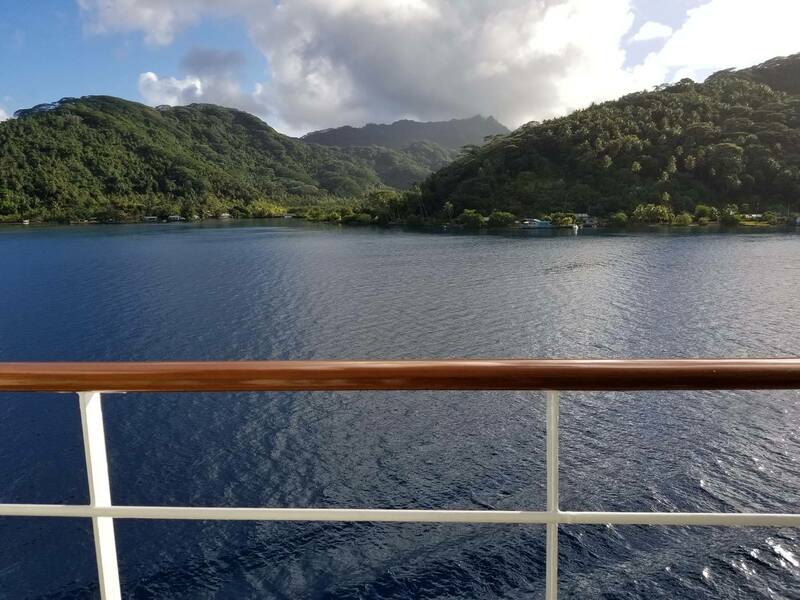 The lush tropical island, with its mountainous terrain lay just a few hundred yards away from the ship with all of its wonders. 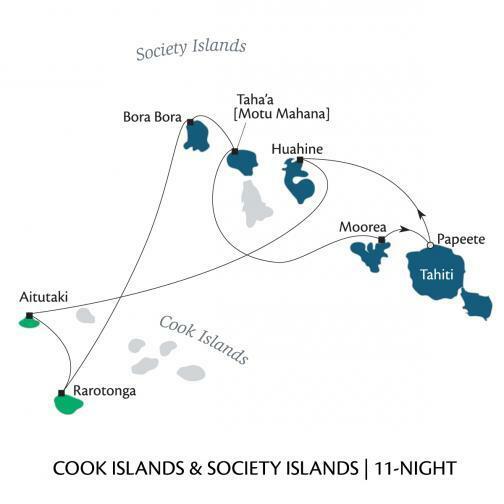 Being in the Society Islands of French Polynesia, you can really understand why sailors from the 18th century European ships that visited these far away islands never wanted to return home. Taha'a is home to a number of vanilla plantations and visitors can tour and sample. 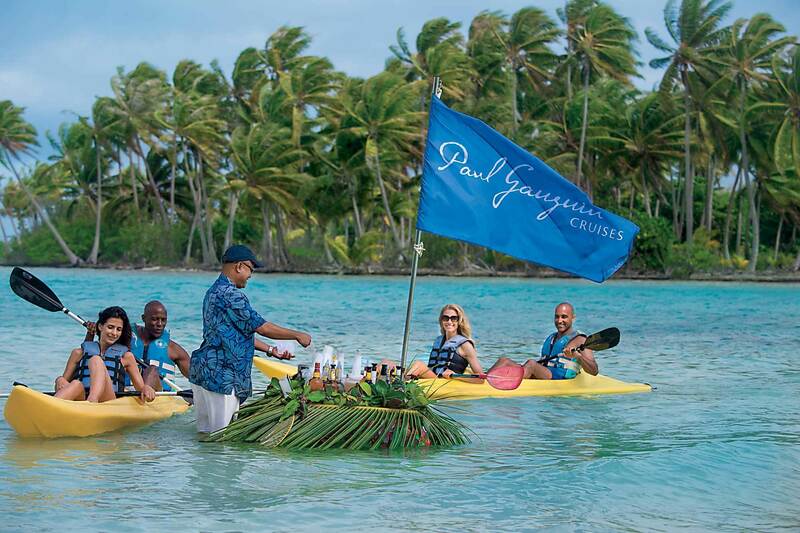 Paul Gauguin Cruises owns a small motu, Motu Mahana, here off the coast of Taha'a and it is a fantastic place to take in a relaxing beach day and enjoy some barbeque as the crew transports over food and drinks for the day. They even set up a beautiful floating bar, so you don't have to get out of the water to enjoy some delicious cocktails. My wife took advantage of the beach all day on Motu Mahana to catch some sun, enjoy a delicious cocktail poured right into a coconut, and take a swim in the perfectly clear water. There are a number of local artisans and jewelers that are selling their goods on the motu so don’t forget to bring some cash or credit cards to pick up a souvenir or lovely black pearl. 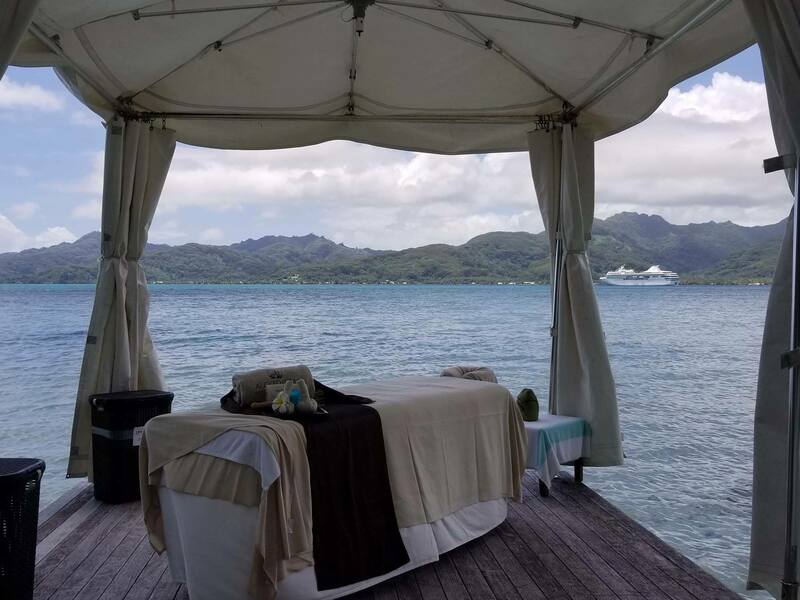 For those seeking some additional relaxation on the private motu, there are massage tables set up and spa appointments can be made to reserve a massage in a secluded area of the beach. You can enjoy a relaxing massage while hearing the sounds of the small waves lapping on the shore. The spa staff are there with the mission to ensure that total relaxation is achieved. 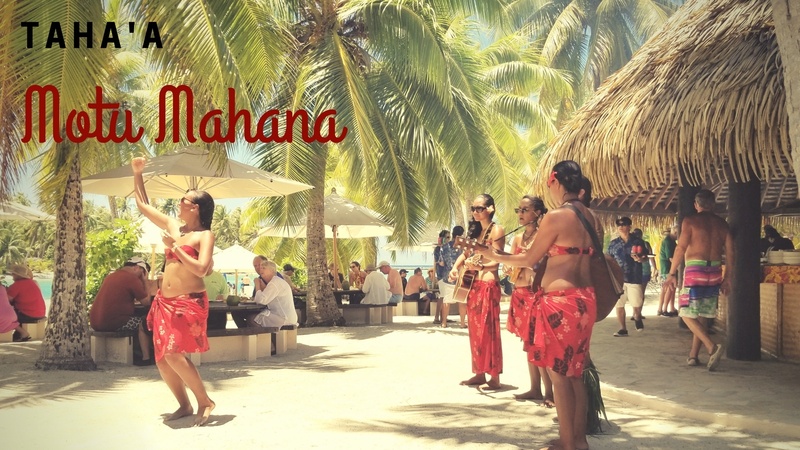 If you're looking for a bit more lively activities, Les Gauguines and Gauguin have some dance lessons and craft sessions where you can make your very own pandanus leaf headband. For the aquatic adventure seeker, the marina staff are there with kayaks, stand up paddle boards, and snorkeling gear to enjoy the perfectly clear water. There is something for everyone on the little motu. I went diving in the morning to a site called Miri, which was in the channel between Taha'a and Raiatea. The dives that morning were amazing. 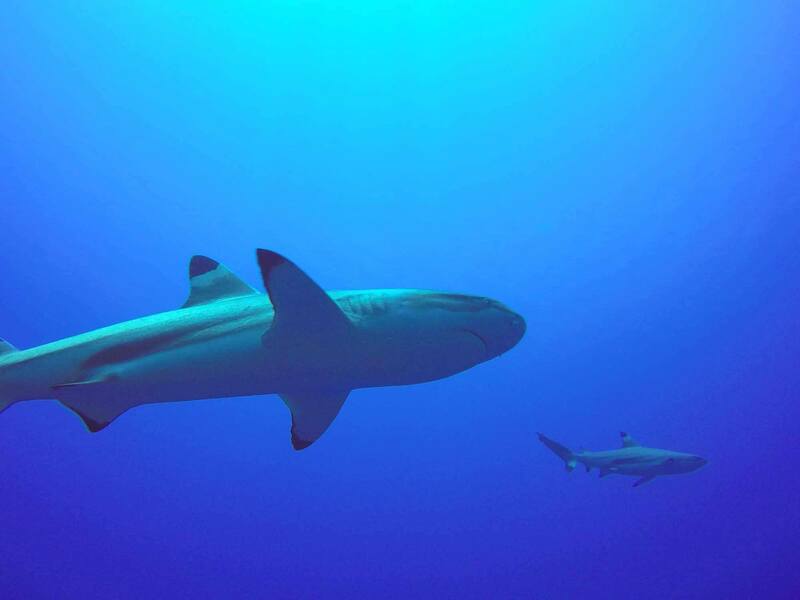 Lots of black tip reef sharks, a hammerhead shark, and even a sea turtle (which is rare for that location) as well as colorful tropical reef fish were all throughout the area. The diving operation on the Gauguin is ideally suited for divers traveling with non-divers. 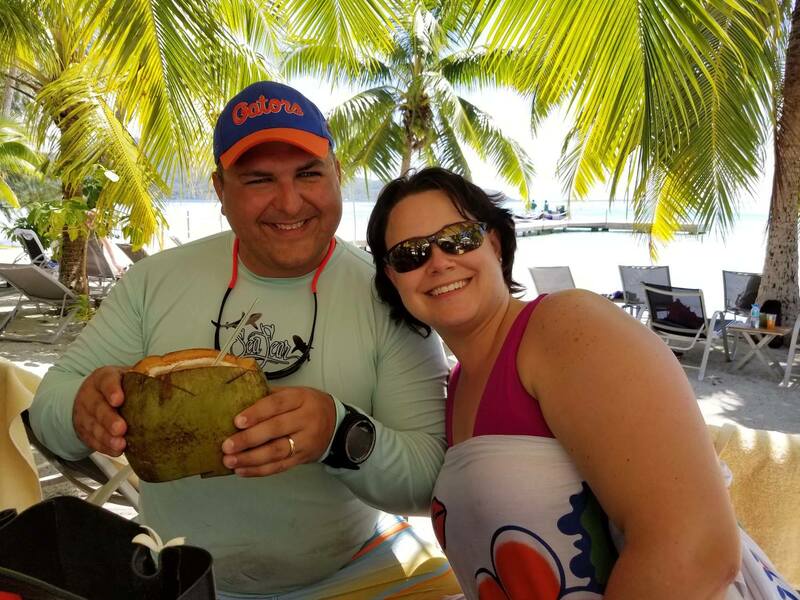 After both of the dives, I joined my wife at the motu for the barbeque and to partake in my own coconut cocktail. It really is great to sail on a small cruise ship like the Paul Gauguin. Everywhere you go, you get to really meet fellow travelers and share your different experiences. There is a real comraderie that develops as you spend more time and make new friends on the journey. Liz and I made several friends from all over the world and hope to stay in touch and visit them in the future.